A randomized clinical trial in patients with HF with preserved ejection fraction (HFPEF) has its researchers and some experts hopeful that there may finally be a drug for the disorder that can improve clinical outcomes. 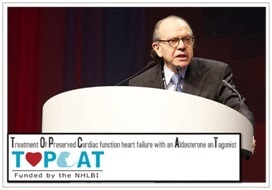 The trial, called Treatment of Preserved Cardiac Function Heart Failure with an Aldosterone Antagonist (TOPCAT), was presented by Dr Marc A. Pfeffer (Brigham and Women's Hospital, Boston, MA) at the American Heart Association (AHA) Scientific Sessions. Despite the fact that the study was negative, they observed that patients who took the aldosterone inhibitor spironolactone had significantly fewer heart-failure hospitalizations. Pfeffer and other experts agreed that TOPCAT points to spironolactone as an option for patients with HFPEF as long as safety issues, like worsening renal function or hyperkalemia, are addressed. He said he will now use the drug on his HFPEF patients, although it will be up to physicians to decide for themselves. "We have a generic medication that we can show how to use safely and, we do believe, relieves the burden these patients have." TOPCAT randomized 3445 heart-failure patients aged at least 50 with an LVEF >45% at 270 sites in six countries to receive the aldosterone antagonist or placebo. At the end of the study, 206 out of 1722 patients on spironolactone (12 percent) had been hospitalized for heart failure, compared to 245 of 1723 patients (14 percent) given placebo. There were no significant differences in adverse events, except, Pfeffer emphasized, more hyperkalemia with spironolactone and more hypokalemia on placebo; there were no hyperkalemia-related deaths. Once again here we have an example of how a negative result can lead us to new discoveries.